Residences have garbage pickup every 2 weeks. All food waste is treated separately. All residences are given a kitchen composting container and a large bin for outdoors. When your indoor container is full, you transfer the waste to the outdoor container, which the city empties every 2 weeks. Of course, you can also compost your own food and yard waste on your own property. The recycling program accepts all paper, cardboard, container plastics, plastic bags and film plastic, glass and metal containers. They are picked up at curbside every week. There are free drop-off points for household hazardous wastes and electronics. I am always trying to reduce trash at our house. We usually take the compost to curbside every 2 weeks, recycling every 2 weeks and put out 1 bag of garbage every 4 weeks. In the warmer weather, we have our own yard waste pile for grass clippings and leaves, either mulched or not. Stubborn things like shrub branches, that take a long time to decompose, can be picked up by the city. I gave myself a challenge for February to examine all of our garbage and see if we were, in fact, separating everything properly. I would also check to see if there were any kinds of garbage we could eliminate. Netting bags from onions and a pommelo; bath puff that was attacked by the cats! This is 2-4 weeks’ worth of stuff depending on our last pick-up. Based on today’s sort-out, I would like to find a bulk source for Swiss-process decaf coffee, and switch over to loose tea. I will pass on the cheap bags of onions and buy them loose instead. We get a ludicrous amount of paper delivered to our door, such as flyers and community newspapers. I will try to find a phone number to opt out. We gave up using paper towel last month (switching over to rags) and so far it hasn’t been a problem. I realize that almost all recyclables can be used as crafts materials but I don’t currently have any crafty scavengers around to use them! Visitors to our house are surprised by the amount of garbage sorting we do, and it does take a while to learn the system. But I am very happy with my city, HRM, for providing this program, and I am happy to participate: keeping in mind, of course, that Reduce is the first of the Reduce/Reuse/Recycle trio! How do you fare with your household trash “system”? I think people around here would revolt if they only had garbage pick up every two weeks. Many households can’t close the containers for a one week pick up (the lid must close to be picked up) and take to asking others if they can add bags to their garbage can. Being on my own, it makes more sense to buy things like onions, oranges, and apples separately, even if it may cost a little more. For two, it is also hard to use up bags of produce, so sometimes I pay for individual items too. I love that your city helps and encourages the composting – what a bonus! NOt sure anywhere in Aust does that. Our recycling pickups are usually fortnightly, with the other week being for ‘green waste’. In my inner city area, we get additional recycling days cause we have no green waste (but I suspect my BIG apartment has a contract with trash, rather than the usually supplied council pick ups – given that we have multiple pick ups a week). Right… this is getting long, I shall post myself on the same! 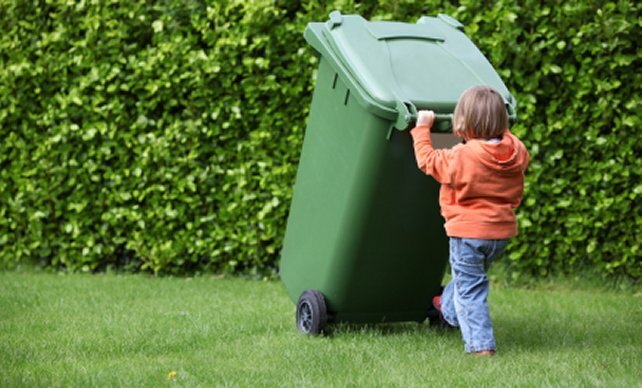 Hi Sarah, What is the difference between composting and green waste – is it just yard clippings, etc? Yes I think so – our green waste can’t have food in it. I wish we had something like that for compost! I’m in Australia too and we have green waste bins (for garden stuff, not food waste) and I feel guilty every time I throw food out. I’m also impressed by how much you can recycle, but I really should look into what is accepted by our council because it could be more than I think. I think our local program was ahead of its time; hopefully other places will do more. I wish that styrofoam and textiles could be recycled. I’m glad the city does composting for food waste because I was never keen on having my own (insects, smell, etc) – it is more work to layer it with garden waste and soil to keep everything working! We have bins exactly like your picture. We have a recycling collection one week and then waste the next. Our bins are always less than 50% full because I try to do all I can to reduce waste – our neighbours have overflowing bins and must find the 2 weekly collection inadequate, which makes me sad. Our city has done those before too; I should have got one! We have opted for once a month garbage pick up here. It saves us money on collection fees, and urges us to recycle and compost more. Since we eat very little meat, we don’t seem to have very sticky garbage. It’s mostly the plastic wrap that comes on items, or lids that aren’t recyclable. We do all of our own compost at home. Fortunately, we don’t have to sort our recyclables. They just all go into one large bin. I keep a box under the kitchen sink for these, and dump into the large bin once a week. We wheel this bin out to the curb about once every 2 months. The only thing I don’t recycle curbside is the aluminum cans. I can get money for those myself by taking to a facility. So once a year I take all our cans, and receive about $5 or so. I have heard rumors that the city of Seattle wants to begin garbage collection just 2 times per month. Right now it’s weekly. I’m not sure how some of our neighbors would manage. Their bins overflow with weekly collection. When you examine what’s in your garbage it really does make you think about commercial packaging. I also take aluminum cans and pop bottles in for a refund and get about the same amount as you! Otherwise the rest of our garbage and recycling pickup is covered by municipal taxes. That’s amazing that your local taxes cover all this. That goes to show you just how important this kind of program is to your area. We had green box and recycling pick up every week and garbage pick up every other week. We are allowed four bags of garbage every other week, and like you we normally only have a bag. Mind you with cleaning out the old basement I will be throwing out three bags this week!!! I am desperately trying to donate some stuff this week so that won’t happen to me!